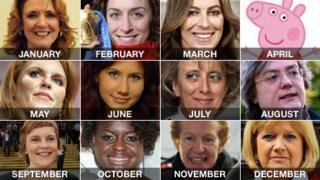 Some of the women who have made the headlines in 2010, left to right: Iris Robinson, Amy Williams, Kathryn Bigelow, Peppa Pig (top), Sarah Ferguson, Anna Chapman, Sue Sim, Mary Bale (middle), Justine Thornton, Gamu Nhengu, Rachel Chandler, Lady Justice Hallett (bottom). The men who made headlines were featured on Friday. Democratic Unionist MP Iris Robinson, 59, tried to take her own life, according to her husband, Northern Ireland's First Minister Peter Robinson, after he discovered she had had an affair with a teenage man. Mrs Robinson had broken parliamentary codes of conduct for failing to report a £50,000 donation from two property developers for her lover Kirk McCambley to buy a cafe. Before the revelations emerged, Iris Robinson announced her retirement from politics and public life on mental health grounds. Amy Williams slid her way to becoming only the ninth British Winter Olympic gold medallist in 86 years and the first solo gold medallist for 30 years. Her victory came in the Games at Whistler in Canada in the women's skeleton event on a trusty sled she calls Arthur. Nicknamed "Curly Wurly" because of her frizzy hair, Williams' performance was all the remarkable since Britain doesn't possess a full skeleton track apart from a dry concrete push track in Bath. They called it the Battle of the Exes. In the red corner for the Oscars' best director award was James Cameron for his sc-fi blockbuster Avatar. In the blue corner was his former wife Kathryn Bigelow for her low-budget, independent movie The Hurt Locker. Bigelow triumphed with her film about an American bomb-disposal team in Iraq. She became the first woman to win the best director award and described her triumph as "the moment of a lifetime". It was a case of a piggy in the middle of a controversy when a Channel Five children's cartoon character named Peppa Pig pulled out of a Labour Party election campaign stunt. Peppa was due to attend the unveiling of Labour's mini-manifesto for families. But E1 Entertainment, the company that licenses Peppa, said, "In the interests of avoiding controversy, we have agreed she should not attend." Lord Mandelson accused the BBC of "stirring up trouble" by blocking Peppa's appearance by leaning on E1. The BBC denied the claim. Sarah Ferguson, the Duchess of York, became the latest victim of the News of the World's "fake sheikh" sting operations. The veteran investigations editor Mazher Mahmood caught her on camera apparently agreeing to provide access to her former husband, the British trade envoy Prince Andrew, in return for £500,000. "That opens up everything you would ever wish for," she told the reporter. Later the Duchess apologised for a "serious lapse of judgement" and admitted that her financial position was "under stress". The glamorous form of 28-year-old Anna Chapman found itself on the front pages of newspapers around the world when she was unmasked as a Russian agent by the FBI in the US. Chapman was part of a ring of so-called "deep sleeper" agents from American suburbs paid to penetrate US policy-making circles. She was previously married to an Englishman in London before moving to the US after divorcing him. Prosecutors described her as a "highly trained agent" and a "practised deceiver". Chief Constable Sue Sim became the public face of the police hunt for the Northumberland killer Raoul Moat. Each day Chief Con Sim, who was in temporary charge of Northumbria Police, faced the media and read out statements in a slow, enunciated style. She drew praise for the human way she dealt with members of the public, especially those living in areas affected by the manhunt. But she also made headlines for a minor gaffe, when she mistakenly uttered that every stone would be left unturned in the search for Mr Moat, although some commentators detected sexism in what they thought was an unnecessary focus on her appearance. Forty-five-year-old bank worker Mary Bale became the subject of a worldwide hate campaign when CCTV footage of her throwing a cat into a wheelie bin was posted on YouTube by the cat's owners anxious to find the culprit. After she'd been identified, Bale apologised for her action: "It was a split second of misjudgement that has got completely out of control." The RSPCA pressed charges and she was fined £250. From geek to chic went Justine Thornton's public image after her partner Ed Miliband's election as Labour leader thrust her into the media spotlight. The heavily pregnant Ms Thornton sported a maternity dress patterned with blue and red hearts accompanied by a blue bolero jacket and a cropped haircut to match, in contrast to her previously less glamorous style. The 39-year-old environmental lawyer, who began her career as a child actress, gave birth to Samuel, the couple's second son, in November. After suffering the disappointment of being voted out of The X Factor, teenage singer Gamu Nhengu faced the prospect of being deported to her native Zimbabwe. Her widowed mother breached visa conditions by wrongly claiming £16,000 in tax credits. A member of the House of Lords, the Earl of Clancarty, asked the UK Border Agency to reconsider Gamu's case. At first they insisted the decision was correct but later agreed to reconsider her case. Their decision is still pending. After being held hostage by Somali pirates, Rachel Chandler and her husband Paul tasted freedom once more after 13 months in captivity. The couple from Tunbridge Wells in Kent were handed over to local officials after the payment of a ransom thought to be in the region of $1m (£649,326). Though they both received a beating for showing defiance to being separated, they were released in good health. The couple held out, according to Mrs Chandler, because "we are survivors". Having refused a legal challenge to hold some closed sessions of the 7 July bombings inquest, the coroner and appeal court judge Lady Justice Hallett earned much praise for her handling of the hearings. Giving short shrift to testimony by authorities she found unsatisfactory, she displayed a contrasting humanity and sympathy for victims who related their experiences. "You are amazing, you sound amazing, you look amazing," she told one survivor. "You've reduced us to silence," she told another.